CRIME, GUNS, AND VIDEOTAPE: Is America Ready For Socialism? It’s really been here for a while in a limited sport of way. Now with the nationalization of Wall Street, banks and soon the automakers it will be complete under Barack Obama. 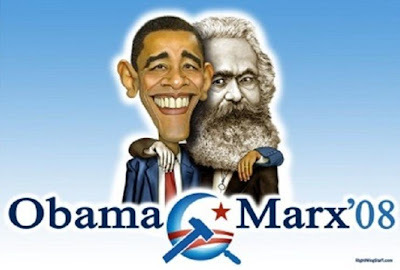 Obama has always had a fascination and admiration for Karl Marx and his failed form of government. The cornerstone of Marx’s Ponzi Scheme is the redistribution of wealth that Obama wants to bring into the USA. The saddest thing is a large percentage of our voters don’t have the slightest clue who or what Karl Marx was. With our vote next Tuesday we can destroy our two-party system and opt to have only admirers of Karl Marx running our lives with an iron fist. The only difference between Socialism and Communism are elections. Socialists like Fidel Castro come in promising elections and never go away. They either abolish elections altogether or change to a retention system with no other names on the ballot. They get the ultimate incumbent protection as Communists until some patriot or patriots kill them. Look for individual rights to be replaced with collective rights. That’s Socialist for no rights. Of course the already lame Left Wing media will be nationalized too with a single voice. Barack Obama made no secret of his close associations with Communists, Anarchists, and Socialists. Obama’s close friends are the most extreme sort of Anti-Americans. Obama is devious, deceitful and dangerous. Obama can be counted on to find any excuse to suspend our Constitutional rights. Say what you will, but after 20 years of being a follower of that thuggish Rev. Jeremiah Wright It’s obvious Obama is just like him except with a softer voice. Have we forgotton how sweet the Big Bad Wolf Sounded when he impersonated Granny in that story Little Red Riding Hood? I cannot understand why so many Americans follow this goof like he is the messiah. He is a typical Chicago Democrat, which really means a crook and a liar. And to top it all off he is a socialist who wants to take money from the working people and give it to those who refuse to work. WTF! A product of the chicago machine.I think that says it all. i think that picture is hilarious! And as much as Obama leans toward socialist idea i don't think even if you gets elected he will have the power to do to the US what Castro has done to Cuba and what Marx once did. There are to many checks and balances out there. The liberal illuminati want us to think Obama is the next great think, i don't buy that but i also don't buy his ability to run our country into the ground anymore than Bush has. But i guess we'll see, cause you know he's gonna win!